What do you need to get a bunch of in-demand influencers together for a night off? Well, an Instagrammable tablescape, disco ball cocktails, and a glittery AF dress code don't hurt. 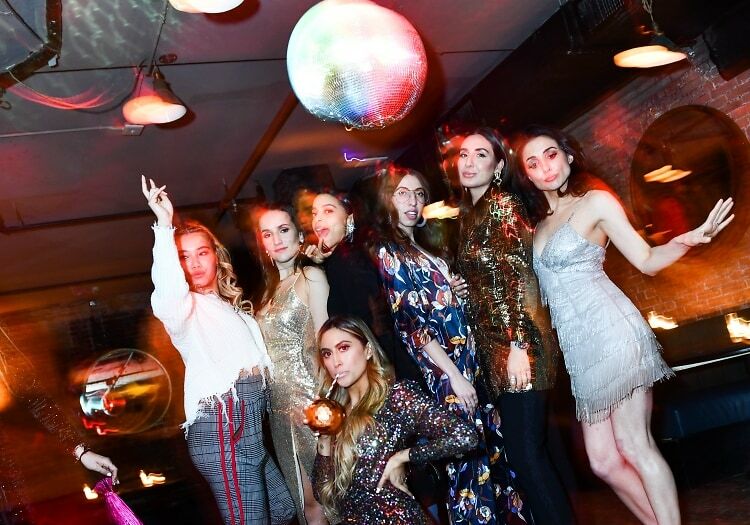 Last night, New York gal-about-town and style blogger Michelle Madonna launched her monthly "Bloggers Off-Duty" dinner series with a disco-themed soiree at Noho hot spot, ACME. Well-heeled guests including Caroline Vazzana, Katie Sands, Sophie Bickley, Lauren Recchia, Jordan Landes-Brenman, and Ellery Lee arrived to a banquet decked out with Venus ET Fleur roses, Absolut Elyx cocktails served in mini disco balls, and custom wooden place settings. It was the perfect scene to relax and let loose - which attendees certainly did under the downstairs disco ball between courses. According to Michelle, the idea is to provide influencers with a moment to chill, network, and vent. "Most of us are a one woman show. We don't have a boss, we don't get a lot of help. A lot of us do everything ourselves, and we spread ourselves so thin trying to do every collab possible to make our blog or brand bigger," she says. "I want to start something for bloggers to kick back and relax and not be under any pressure... I want my blogger babes to have a chance to let loose and have some wine and whine time!" Of course, even off-duty, these fashionable pros dressed to impress. Click through for an inside look at the glam girls' night!